I promised some unusual reports about seeds and I think you will agree! Here are the first few items which all have to do with seed dispersal. Seeds stick to some animals and later drop off. Sometimes the wind carries seeds away. Seed Dispersal turned out to be a learning event. We read a little about seed dispersal first and the story about how velcro was invented is part of this. You have to admit that is unusual! But, true! A man walking his dog found that certain seeds would stick to the dog's fur more than others and the hook and loop closure system was born. Some of our groups had to make a seed dispersal model of how seeds attach to animals. In the photo above you can see the "turkey" a group made with a yellow glove. They added the turkey wattle and some seeds that were clinging to its feathers. Then there is the exploding part! We watched a video of seeds that pop open in a violent explosion that scatters the seeds all over. Kids loved the video and couldn't wait to make something explode. Thank goodness I had some balloons. In the photo, you can see kids trying to pop the balloon to get their seeds to scatter. What you cannot see is that the balloon is attached to an elaborate flower- the flower had to be large because the balloon seed pod was so large. Seed dispersal is all about how seeds get moved from the flower to the soil so they can germinate. We learned many different ways this happens and another of those is wind travel. I envisioned kids making a model of wind dispersal by creating a dandelion type device so they could blow the seeds off. The kids had other ideas. In the photo, you can see that the group built a parachute for their seeds and then dropped it. As it floated to the ground they pulled a string which released the seeds. I told you this was unusual! Getting seeds inside a bird feeder is harder than you think. So is getting the seeds out of the birdfeeder. Birdfeeders were painted and lacquered and ready to load with seeds. We hope! My fifth graders had a blast designing and building these bird feeders. I had an array of cardboard boxes and empty bottles and they chose what they needed based on their design. They put it all together with hot glue and tape and then it was time to decorate. We had so many creative bird feeders with perches for the birds to sit on and little spouts to use when pouring in the seeds. In the photo above you can see the perch in the front and on the top right you can see the seed pouring device. "How do we get the seeds into the feeder part?" Good question! In the top photo the spout was great, but when we poured the seeds in they didn't exactly land where they needed to. In the photo with the white bottle feeder, the bottle didn't hold a lot of seeds because of the placement of the hole. More opportunities for problem-solving. Groups had to redesign to find ways to get the seeds in and ways for the birds to get them out! A flower has an ovary and that's where you will find the seeds. Flowers and their parts come in all shapes and sizes! 3-D Flower Models with third graders! Third graders were learning about the parts of a flower in their regular classroom so we just extended that study in the lab. We talked about what each of the parts of the flower does and even dissected a real flower. Next, we created our own flower models. These had to have all the parts represented by the materials I made available and then labeled. Ah, the ovary. So, we stopped to watch a Magic School Bus video which explains it perfectly and then we went back to creating our flower models. As you can see from the photos the flowers were amazing and different and all sizes and shapes. And that is exactly the way they are in nature, too. Which makes flowers very unusual! Speaking of unusual I had a Popaw like no other. That summer that he planted a whole field of watermelons we would go out to visit. And, when I say out- I mean out-in-the-country, away from the city because that's where his farm was. When we pulled into the driveway he would come running outside with a butcher knife and a handful of forks. He would cut open a giant watermelon and we would sit under the shade trees and eat until we were ready to pop. He'd throw the rinds over his fence to his pigs and then tell us a story or two. 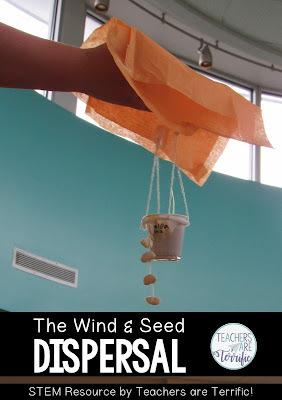 If you need a project to teach your kids about seeds these three are fabulous!